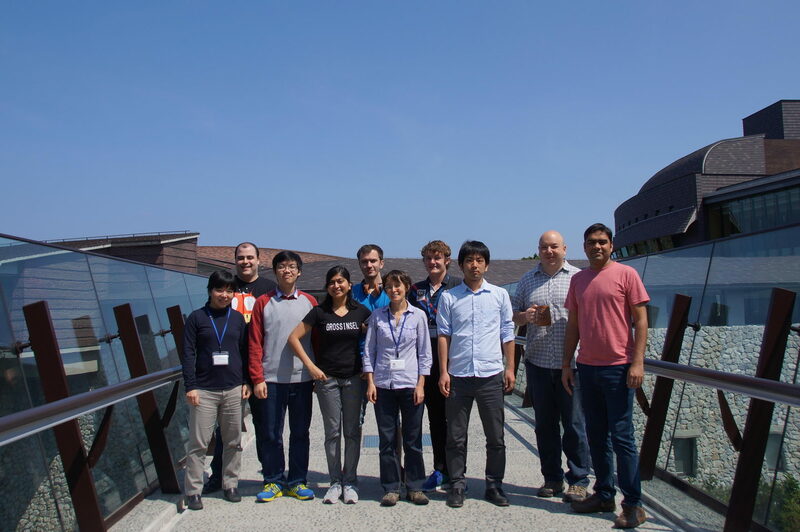 During FY2016, our group has been focusing on studying photoluminescent metal complexes and their application to create stimuli-responsive polymers. The idea developed in our group is to utilize dynamic and flexible metal complexes as mechanoresponsive probes. In 2016, we demonstrated the first practical application of our approach in mechanoresponsive polymer design. We discovered a new class of photoluminescent Cu(I) complexes supported by a simple N-donor macrocyclic ligand, N4 pyridinophane. This complexes show tunable luminescence that can be easily controlled by the ligand design. As these complexes are based on an inexpensive metal and easily accessible, non-phosphine ligand, they show promise in development of new luminescent materials. Furthermore, we utilized similar copper complexes to create unique polymer material that shows fast and reversible response to mechanical stress. 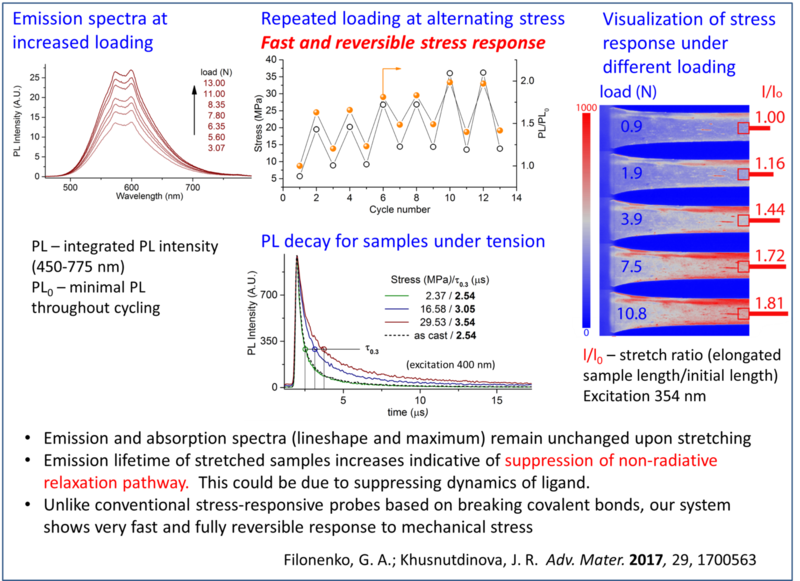 The material design is based on the novel concept developed in our group to use conformationally flexible ligands to observe fine changes in response to mechanical stress. We also started the project on CO2 reduction to useful organic products catalyzed by an earth-abundant and cheap metal, manganese that we will continue to study in FY2017. Description: Utilization of manganese complexes with proton-responsive ligands for reduction of CO2 to value-added products. We have developed a new type of photoluminescent Cu(I) complexes supported by a simple N-donor ligand, N’,N’’-dialkyl-2,11-diaza[3.3](2,6)pyridinophane (RN4), that show emission in the solid state and in solution. The N4 ligand provides a convenient platform to create well-defined, solution stable Cu(I) complexes that show easily tunable photophysical properties that can be controlled by the complex charge and nature of the substituent at the axial amine door. In complexes 1-6 (Scheme 1), emission maximum varies in the 0.5 eV range and quantum yield ranges from 0.02 to 0.78. Figure 1: Synthesis and X-ray structures of pyridinophane Cu(I) complexes. Figure 2: Photophysical properties of pyridinophane Cu(I) complexes. The intriguing feature of pyridinophane ligand is its conformational flexibility and dynamic behavior is solution, which likely affect the photophysical properties. We envisioned that this properties can be instrumental in the design of new stimuli-responsive materials as described below. Furthermore, we were able to utilize these dynamic copper complexes for the design of polymers that can show fast and reversible changes in response to stress. In particular, we incorporated pyridinophane ligands into polyurethanes. 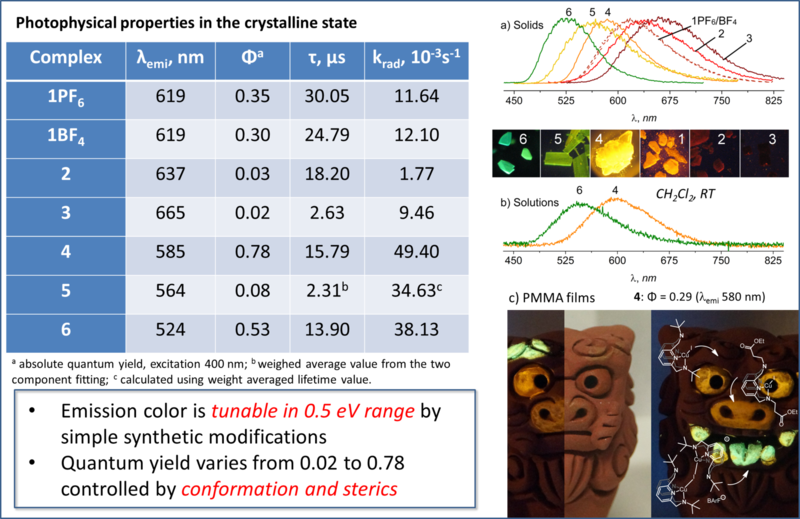 As a result, we observed fast and completely reversible changes in photoluminescence intensity of polymer films in response to tensile stress. Thus, the photoluminescence intensity increases in stretched films and returned to the original value after film relaxation, over the course of multiple cycles. By contrast to currently existing systems, this type of stress sensing does not require any bond scission, leading to almost instantaneous response and complete reversibility. We propose that this stress-sensing mechanism is due to suppression of the dynamics of the complex responsible for non-radiative relaxation. Figure 3: Design of stimuli-responsive polymers utilizing conformationally flexible ligands. Figure 4: Stress-responsive behavior of polyurethane polymer films incorporating dynamic pyridinophane-based copper complexes. 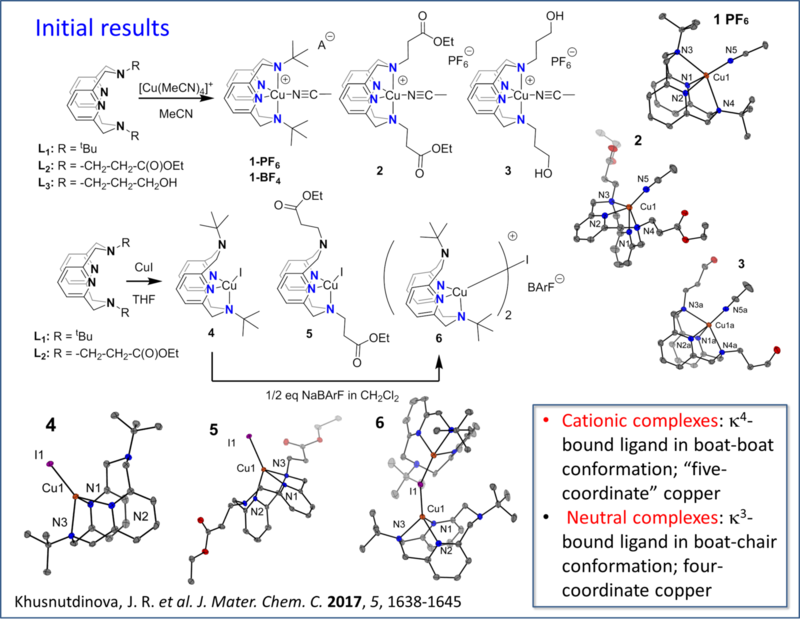 In FY2016, we have also started our investigation of CO2 reduction catalyzed by earth-abundant metal complexes, in particular by Mn complexes supported by simple and robust non-phosphine ligands. This work started as a collaboration with Prof. Carlo Nervi (University of Turin), and initial experiments were performed by our first research intern student Luca Nencini. We tested a series of Mn complexes with various simple bipyridine-based ligands and were able to identify an active catalyst for homogeneous CO2 hydrogenation to formate. Interestingly, this study helps to draw some parallels with electrochemical Mn-catalyzed CO2 reduction and homogeneous hydrogenation catalysis. The initial results were reported at the ISCH in Kyoto. Figure 5: Mn-catalyzed CO2 reduction. Filonenko, G., Fayzullin, R. R. & Khusnutdinova, J. Intramolecular non-covalent interactions as a strategy towards controlled photoluminescence in copper(i) complexes. Journal of Materials Chemistry C 5, 7, 1638-1645, doi:10.1039/C6TC04989C (2017) . Khusnutdinova, J., Dubey, A. & Nencini, L. Ligands containing proton-shuttle groups for CO2 hydrogenation, in ISHCXX (20th International Symposium on Homogeneous Catalysis), Kyoto, Japan, 2016.0724 (2016). Dubey, A. Catalytic ester metathesis reaction and its application to transfer hydrogenation of esters, in 6th EUCHEMS chemistry Congress, Seville, Spain, 2016.09.12 (2016). Rivada-Wheelaghan, O. C., Shimon, L. J. W., Ben-David, Y. & Milstein, D. Iron: A New Player in the Z-Selective (Cross) Dimerization of Terminal Alkynes Catalysed by Transition Metal Complexes., in XXXIV GEQO organometallic Chemistry Group, Girona, Spain, 2016.09.09 (2016). Rivada-Wheelaghan, O. & Khusnutdinova, J. New Naphthyridne-Based Platform for the Development of Selective Hetero-bimetallic Complexes. Synthesis and Reactivity., in EuCheMS Chemistry Congress, Seville, Spain, 2016.09.14 (2016). Patil, P. & Khusnutdinova, J. Photoluminescent Copper(I) Pyridinophane Complexes: effect of steric bulk on structure and photophysical properties, in The 97th CSJ Annual Meeting — The Chemical Society of Japan, Yokohama, Japan, 2017.03.16 (2017). Filonenko, G. Intramolecular Non-Covalent Interactions as a Strategy Towards Controlled Photoluminescence in Copper(I) Complexes, in The 97th CSJ Annual Meeting — The Chemical Society of Japan, Yokohama, Japan, 2017.03.17 (2017). Patil, P. & Khusnutdinova, J. Steric Effect on the Structure and Luminescence of Copper(I) Pyridinophane Complexes, in The 97th CSJ Annual Meeting — The Chemical Society of Japan, Yokohama, Japan, 2017.03.17 (2017). Lapointe, S., Khaskin, E. & Khusnutdinova, J. Synthesis of bulky, electron rich PNP pincer ligand and their Ni complexe, in The 97th CSJ Annual Meeting — The Chemical Society of Japan, Yokohama, Japan, 2017.03.18 (2017). Dubey, A. Hydrogenation of CO2 to Formates and Formamides via Bio-Inspired Mn Complexes, in The 97th CSJ Annual Meeting, Yokohama, Japan, 2017.03.18 (2017).